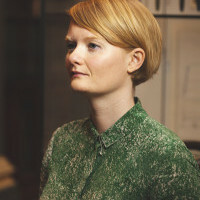 Marie Foulston is the Curator of Videogames: Design / Play / Disrupt at the V&A South Kensington. She is an independent curator with a love for the alternative, playful and disruptive. She has previously worked alongside partners including MoPOP, the Art Gallery of Ontario and the Game Developers Conference (San Francisco) and is co-founder of the UK-based independent game collective Wild Rumpus. Videogames: Design/Play/Disrupt is a ground-breaking exhibition exploring contemporary videogame design and culture opening this September at the V&A. The exhibition’s lead curator Marie Foulston joins us to provide an exclusive behind the scenes preview of this landmark show. She will provide unique insights into the exhibition’s design and curation and discuss just what it takes to bring videogames into the world’s leading museum of art and design. The show explores the medium from the mid-2000s, when major technological advancements profoundly changed the way videogames are designed, discussed and played. Rarely seen design materials from the desks and hard drives of world leading designers sit alongside brand new large-scale immersive installations to take visitors into the heart of the design and culture of videogames like never before.